Mark a position at the height you want the door handle for the latch. 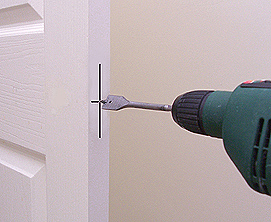 Using a flat drill bit just slightly bigger than the diameter of the latch body drill a hole. The hole should be deep enough so the latch body can slide completely in. 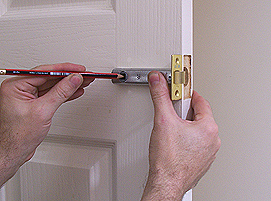 NB Make sure you've marked centrally on the door and when drilling make sure the drill is level. 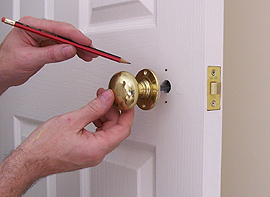 Push the latch fully into the hole you've made and mark round its plate with a sharp pencil. 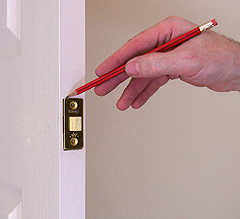 Carefully chisel along your marked lines to the depth the same as the thickness as the latch plate. Then chisel out to that depth. Using the latch plate as a guide mark the position for the spindle hole and drill a hole slightly bigger than the spindle. You should now be able to slide the latch into the recess and see the spindle hole in the centre of your drilled hole. Check that the spindle locates into the latch. Place the spindle in one of the handles and slide it in the spindle hole you've just drilled. Making sure the spindle is level, mark the screw holes and screw the handle in place. 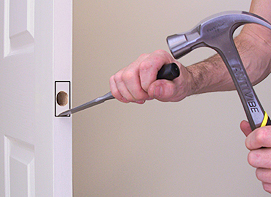 Fix the other handle similarly but make sure it lines up horizontally and vertically with the first otherwise the mechanism will feel stiff when you turn either door handle. Finally fix the strike plate to the door frame. Close the door so you can see where it needs to go and mark with a pencil. Mark around and inside the strike plate then chisel out a recess for the plate and also the hole where the latch locates. Finally, screw the strike plate in position. 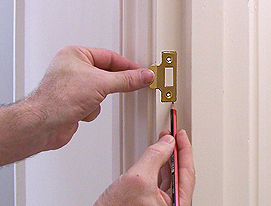 Your door handle is now complete.